HANOVER, N.H. (JTA) — The 50th anniversary of the 1965 march at Selma is being commemorated this year with the release of the film “Selma.” Regrettably, the film represents the march as many see it today, only as an act of political protest. But for my father Abraham Joshua Heschel and for many participants, the march was both an act of political protest and a profoundly religious moment: an extraordinary gathering of nuns, priests, rabbis, black and white, a range of political views, from all over the United States. Perhaps more an act of celebration of the success of the civil rights movement than of political protest, Selma affirmed that the movement had won the conscience of America. President Lyndon Johnson had just declared, “We Shall Overcome,” and congressional passage of the Voting Rights Act would come quickly. Thanks to the religious beliefs and political convictions of the Rev. Martin Luther King, Jr., coalitions had been built, religious differences overcome and visions articulated that meshed religious and political goals. 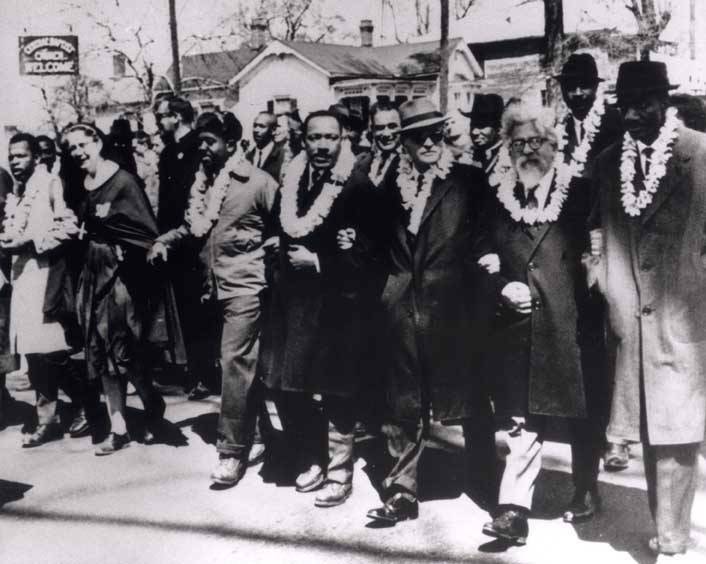 My father felt that the prophetic tradition of Judaism had come alive at Selma. He said that King told him it was the greatest day in his life, and my father said that he was reminded at Selma of walking with Hasidic rebbes in Europe. Such was the spiritual atmosphere of the day. Imagine: My father arrived in 1940 as a refugee from Nazi Europe, where all too many Christian theologians were declaring Jesus an Aryan, not a Jew, and throwing the Old Testament out of the Christian Bible because it was a Jewish book. It seemed miraculous for him to discover Martin Luther King, Jr., placing the Exodus and the prophets of Israel at the center of the civil rights movement. Of course, the dream that Pharaoh might join the Israelites was not realized. Racism in America remains tenacious, and its slipperiness means that while the Voting Rights Act was passed by Congress and signed by the president following the Selma march, the disenfranchisement of black America continues with insidious new forms of legislation. The religious inspiration that led us to Selma continues, and the photograph of my father marching in the front row there — with King, Ralph Bunche, John Lewis, Rev. Fred Shuttlesworth and Rev. C.T. Vivian — has become iconic. What a pity that my father’s presence is not included in “Selma.” More than a historical error, the film erases one of the central accomplishments of the civil rights movement, its inclusiveness, and one of King’s great joys: his close friendship with my father. The photograph reminds us that religious coalitions can transcend and overcome political conflicts, and it also reminds us that our Jewish prophetic tradition came alive in the civil rights movement. Judaism seemed to be at the very heart of being American. Yet Selma was also a crossroad for Jews as it was for blacks. Would we follow the model of King and my father, of nonviolent liberation from oppression? Or would we follow calls to violent action, symbolized by the Black Panthers and the Jewish Defense League,whose leader, Meir Kahane, urged Jews to copy the Panthers and militarize themselves against anti-Semitism? Both blacks and Jews had to choose between a path of resentment, rage and violence, or a path of peace, nonviolence, persuasion and coalition. The consequences of that choice remain with us to this day. Few events in history of the United States are as inspiring as the march from Selma. Walking across the Edmund Pettus Bridge (named for a Confederate general) opened a door, inviting all Americans to join in unity against segregation and racism. Yes, the Selma march was a protest against forces of destruction and oppression, against legislation and institutions of bigotry and cruelty. But its mood was filled with a biblical sense of optimism that justice would ultimately prevail in the United States. Today, Selma represents a hope for redemption, a hope expressed by the prophets of Israel, of an era in which bigotry will finally come to an end. For the Bible, my father taught, the ultimate expression of God is not wisdom, magnificence, land, glory, nor even love — but rather justice. Justice is the tool of God, the manifestation of God, the means of our redemption and the redemption of God from human mendacity. Previous Previous post: Radical Islam Should Have a Fraction of this Kind of Humanity!